Forest City acknowledges unspecified delays in Pacific Park, cites $300 million "impairment" in project value; what about affordable housing pledge? Updated Monday Nov. 7 am: Note follow-up coverage of stock price drop and investor conference call and pending questions. Pacific Park Brooklyn is seriously delayed, Forest City Realty Trust said yesterday in a news release, which further acknowledged that the project has caused a $300 million impairment, or write-down of the asset, as the expected revenues no longer exceed the carrying cost. The Cleveland-based developer, parent of Brooklyn-based Forest City Ratner, which is a 30% investor in Pacific Park along with 70% partner/overseer Greenland USA, blamed the "significant impairment" on an oversupply of market-rate apartments, the uncertain fate of the 421-a tax break, and a continued increase in construction costs. if market-rate construction is delayed, will the affordable housing also be delayed? if so, what happens to the June 2014 agreement, reached by New York State and some community community negotiators, to guarantee--with penalties--the 2,250 units of affordable housing by May 2025, "subject to extensions set forth in the Development Agreement and the General Project Plan"? will affordable housing be built on sites previously planned for market-rate housing? will covering the railyard for vertical construction be delayed? And doesn't that prolong blight? how much tension is this causing between Forest City and its Shanghai-based partner? beyond the three sites already up for sale/new investment, how much more might be sold? will the developers seek more subsidies, or relaxed terms regarding the affordable housing? Note that Forest City, which is the minority partner in Pacific Park, had to jointly agree with joint venture partner/overseer Greenland USA, which owns 70% of the project/development rights going forward (excepting the arena and the 461 Dean tower). But no mention was made of a joint decision. In a supplemental document filed with the Securities and Exchange Commission, the developer said that, regarding Pacific Park, it recorded "an impairment of $299.3 million ($266.0 million and $33.3 million allocated our projects under development and projects under construction, respectively." "We also recognized a significant impairment of Pacific Park Brooklyn as a result of our decision to revise the project schedule and related assumptions in light of evolving market conditions, including the impact of increased apartment supply, uncertainty surrounding 421A tax abatement and continued escalation in construction and trade costs," Forest City CEO David LaRue said in the statement. 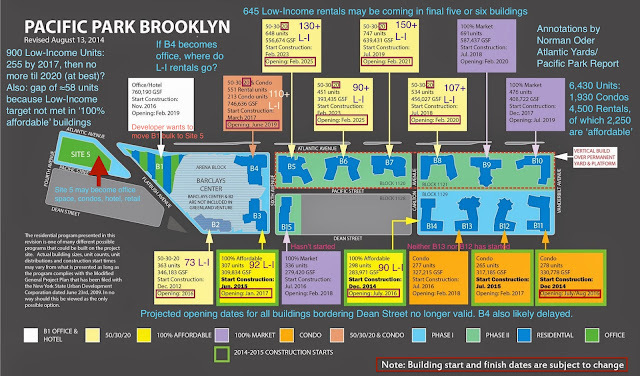 During the three months ended September 30, 2016, it became evident the occupancy and rental rate declines in the Brooklyn market was determined not to be temporary as a result of an increased supply of new rental product amplified by the sun-setting and the uncertainty around the 421 A real estate tax abatement program. Over the last quarter, the condominium market in New York has also softened, causing the projected sale schedule for 550 Vanderbilt to be adjusted accordingly. Separately, the construction costs across the New York market continue to trend upward, resulting in increases in the estimated trade costs for certain infrastructure as well as vertical construction. In addition, the expiration of and the continued uncertainty related to the availability of the 421 A real estate tax abatement program puts further stress on anticipated returns.. the Company updated the discounted cash flow model to reflect the updated timing of the project schedule as well as the revenue, expense and cost assumptions. Based on the above, the estimated fair value of the investment no longer exceeded the carrying value. As a result, the Company recorded an other-than-temporary impairment of$299,300,000 during the three months ended September 30, 2016. The remaining basis in the investment (net of estimated future funding obligations) is not material. No updated schedule was announced, but presumably there will be questions during today's conference call with investment analysts. "While the Pacific Park Brooklyn impairment is a disappointment, revising the schedule to delay additional future vertical development reflects the tough decisions that are part of our disciplined approach to capital allocation," LaRue said. "As we have said before, we will activate new opportunities from our pipeline of entitlements only when and where we believe we can achieve an appropriate risk-adjusted return." He made no mention of the affordable housing deadline. There seem to be some delays, however. A separate 10-Q document filed with the SEC offers the following timetable. Note that "100% affordable" 535 Carlton could take a year to fill up, until the fourth quarter of 2017, as could the similar 38 Sixth Avenue, starting in the second quarter of 2017. Meanwhile 550 Vanderbilt is supposed to open in the first three quarters of 2017. The document, oddly enough, said that, in the third quarter of this year, Forest City opened two new properties, including "461 Dean Street, a 363-unit apartment community at Pacific Park Brooklyn." Actually, it's by no means open. The Supplemental document says construction is complete and that, as of 9/30/16, 160 of the 363 units had received a certificate of occupancy. According to p. 50 of the Investor Presentation below, as of 10/27/16, the developer has a 3% lease commitment at 461 Dean. Presumably that applies to the 50% market-rate units, and/or the retail, not the 50% below-market "affordable" units, for which there was a lottery.